This whole thing about India being multicultural puts in so much pressure on a normal human bring in totally worthless situations. SO I get invited for a baby naming ceremony. Nice! And the million dollar question of what to wear for the function comes up. Which state of India does the family belong? Because all 29 states and the 7 union territories will have different ways of doing the same function. Which religion would the function represent? Is the tradition really going to be traditional or contemporary? Like the million possibilities of geographical location and religious orientation wasn’t enough people who are in the city choose to do it differently from people in the village. Why? Because the city dweller is of course ore sophisticated. In cases of inter-state/ inter-religious functions, it gets all the more messy. Both parties would want it to go their way and as a compromise there would be a little of this and a little of that. Why?? Why can’t something be absolute?! So, after a lot of introspection I finally decide to play safe. 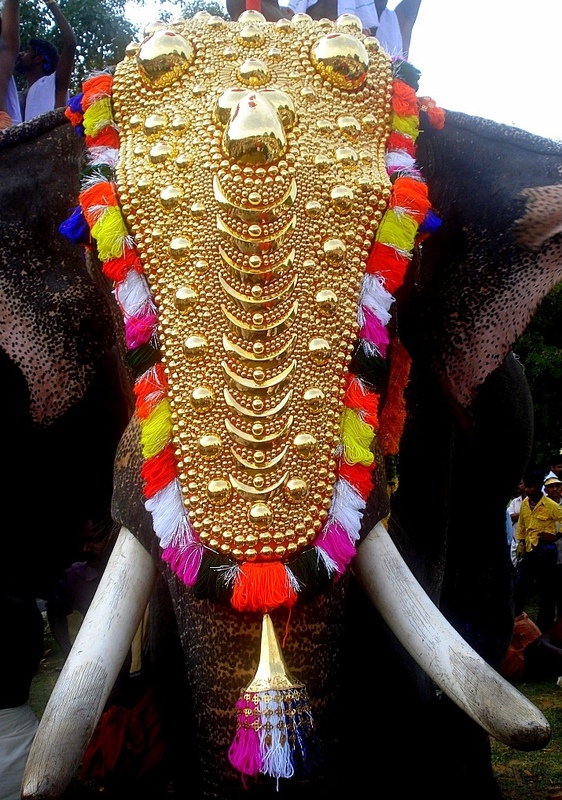 I decide on a Kanchivaram sari and some gold ornaments (just so that people know which part of India I come from!). I mean kanchivaram saree is for all occasions traditional – isn’t it?! Sabarish sees me and is dumb struck. Awww my beauty – mesmerizes him. He doesn’t utter a word. He isn’t any good with compliments anyways – I think to myself. ‘Umm. Don’t you think it’s a little too much?? I think you can tone down – just a bit’. Wrong answer. I narrow my eyes and gaze at him so hard that he feared for his life. He quickly corrected himself ‘You look wonderful darling!’ Hmm. Better. My little Dhruv looks up at me in sheer wonder – like he is seeing an elephant in a temple procession! Oh my baby! You will soon realize the pomp and show in any Indian function – I think to myself. We drive down to the venue. The drive was pretty silent. I was busy adjusting my flowers and jewellery. We finally reach. We step out, the guards greet us. We walk into the venue, my head held high. And then in a fraction of second I wanted to run. Run for my dignity. There I was standing amidst a crowd of less than 50 people all dressed in cocktail. WOW!! I, in my bright red Kanchivaram was obviously the focus of attention. I immediately turn around to Sabarish with fire spitting from my eyes. My nose was turning red out of fury. The rest of the evening I tried hard – real hard – to convince people that I had another south Indian wedding to attend and hence the costume. Atleast now I know what the elephant at the temple fest would feel!! Next > The Art of Procrastination! laughing o loud …. OMG !!!! It was fun reading this post but at the same time it was very relevant too. Every woman must have faced it, including me, and quite frequently unless she has some divydrishti about the occasion. Am so glad I have company. Now I know why absolute rules need to be in place and conveyed!! Now who wears cocktail dress for a naming ceremony. They were all dressed wrong 😉 😉 I can imagine the discomfort you must have felt at that moment but good and fast thinking may have saved your day :p. I have this confusion when I go to kids birthday parties. I mean sometimes the crowd is very “Hip(LBD et al)” and sometimes very “Toned down (Salwars) and I manage to get it wrong everytime. I knowww!!!! Who does that – in India?! Thanks for the kind words..! !